Great stuff, right from the cover onwards. To honour the ruby anniversary, the logo and the red bits of King Carlos' cover have a plasticy sheen to them. I'm guessing the David Aja variant cover will have the same effect (being mostly black and white except for the red bits on Dredd's helmet)? T.M.O tells us that all the stories in this special are ruby or red-themed, which leads to a bit of fun waiting for the red to appear (some a little quicker than others). Rufus Dayglo draws a variety of early 2000AD characters to lead in to a M.A.C.H.1 / Zombo pastiche where the red theme is from Z.O.M.B.O's partner, Tarquin Ruby. Mark Sexton draws an S.M.S. inspired Mek-Quake (that's what I think, anyway) playing with 2000AD figurines. I'm thinking of Wash's voice here: "Curse your sudden but inevitable betrayal!" This leads in to a nice one-off Ro-Busters story, set in the Starlord / 2000AD and Starlord era where we find out the secret of a well-behaved Ro-Jaws! Hammerstein's eye glows red when he's angry, and Mr Ten Percent's when he's stressed - the only colour in the six pages. Over the page Cliff Robinson and Dylan Teague give us a centrespread (which isn't quite in the centre pages) of the Terrameks (and Charlie, and Mek-Quake). Patrick Goddard takes us to the Doghouse where we're led in to a Durham Red tale (though Alpha features in almost as many panels as Red). There's a character called Red, there's space vampires and lots of blood as Lauren Beukes and Dale Halvorsen turn in a pretty good story. Carlos' Durham seems to look quite a bit like Integra Fairbrook in this seven-pager. Bryan Talbot provides a full-page portrait of Torque for his interlude. Mills returns for a second story with the tale of how Sláine tried to get in to the Red Branch. Ties in slightly to the themes that have appeared in the most recent book to appear in the prog, but largely self-contained. As well as the Red in the title, there's quite a bit of the red juice too, though not how you'd normally expect in a Sláine tale. 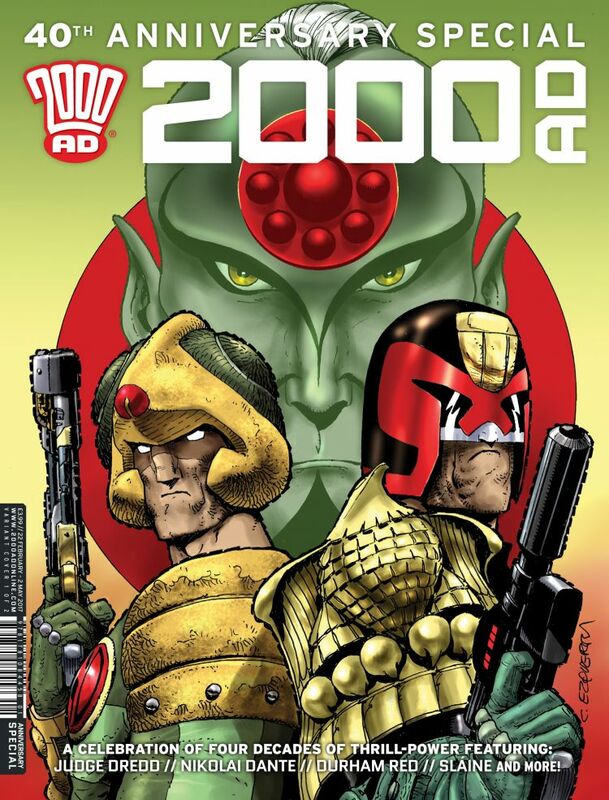 Cyber-Matt makes a brave attempt to stick up for the droids who have made 2000AD great over the past 40 years, before being found out by green bonce (this inerlude is from Mike Collins). I'm a bit confused about this. Is it like a summer special that I have to hunt out at FP, or will subscribers get a copy? I asked the same question not so long ago. Subscribers will not receive it as part of their sub. I ordered my two copies, one of each cover, from the tooth web shop. Sounds great, and I can't wait to read it tonight. Dagnabbit but this is burning a hole in my bag - I'm trying to be good, trying to save it for a long leisurely soak in the tub (as befits its stature), but I'm just not that strong... a quick lunchtime fumble, I think. Well, the pre-ordered Carlos variant failed to arrive through the post... so I bought the other cover at Smiths! No way am I waiting for this prog! Really hope this episode of Zombo isn't a one-off, and leads into the next series! Bought both covers from the web shop but neither turned up today. Annoyingly, not only was I in a comic shop at lunchtime (seeing Orbital's 2000AD exhibition, which was good) my local Thrill Power Merchant had it, taunting me from the window. Snagged the David Aja variant cover today, which I must admit is the cover I prefer. A very striking cover indeed. I will be after the Carlos cover as well, but happy to have gotten this one. Shame there isn't a poster inside - with blank reverse - like Prog 2000, as that made an excellent place to gather signatures. Bit of a missed opportunity with Cliff Robinson's Terrameks spread - though I still prefer a poster you can see all of without having to rip it out! Absolutely fantastic stuff. Every story a triumph. Even the linking pages were genuinely funny in places. Thought mine had arrived today, but instead I got a replacement for a mangled 2016 special I ordered. Bah. On the plus side, good to see Rebellion's new shop droid's speedy regarding replacements.